Daddy, Tatay, Itay, Papa — however way you call the man of the house, it’s his day on June 18. 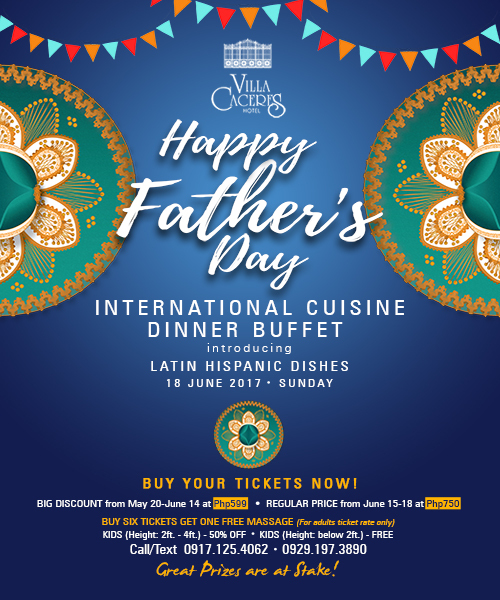 So when in Naga, treat him to the Happy Father’s Day International Cuisine Dinner Buffet at Villa Caceres Hotel. Let your dad enjoy delectable Latin Hispanic Dishes, meticulously created to suit a wide variety of tastes and palates. This dinner buffet happens only on Sunday, June 18. Tickets are now available at Villa Caceres Hotel in Naga at Php 750 per person. But if you purchase from today until June 14, you get the early bird rate pegged at Php 599. What’s more, if you buy 6 adult-rate tickets, your dad can indulge in a free massage. That’s not all, because the hotel will also be holding a raffle wherein you can win great prizes! Children with heights between 2 feet and 4 feet get 50% off the regular ticket price, while kids below 2 feet in height eat for free. To purchase tickets and for more information, call or text 0917-1254062 or 0929-1973890. Make this occasion even more special by booking a weekend stay at Villa Caceres Hotel.